Cancer R&D Company Joins the NC Research Campus. The NC Research Campus (NCRC) welcomes R&S Chemicals, a cancer research and development company, to its roster of companies leasing ready-to-use laboratories in the David H. Murdock Core Laboratory. Srisailas Muthialu, PhD, PMP, vice president of R&S Chemicals, is leading the company’s study of two molecules that demonstrate anti-cancer activity. With additional research that will be done in collaboration with parent company Chem-Master International, Muthialu will explore the molecules and their potential application for the prevention or treatment of cancer. Muthialu opened R&S Chemicals in mid-September and is still unpacking boxes and ordering supplies for the 950-square-foot laboratory and office. Since he lives in Fort Mill, SC, he is enjoying the advantage of working closer to his family than other locations would have allowed. He will be joined soon by his business partner Ramesh Gupta, PhD. Gupta has over 35 years of industry experience with the development of medicinal compounds that are used in the treatment of illness like allergies and chronic diseases such as cancer and diabetes. Muthialu and Gupta will continue supporting Chem-Master as director of business development and vice president, respectively. Chem-Master International is a contract research and development company located in New York that specializes in organic and medicinal chemistry. 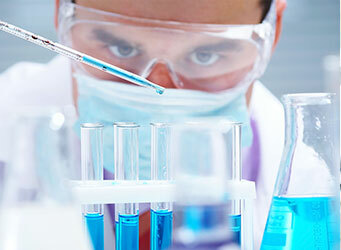 R&S will provide similar services customizing the synthesis of organic compounds. R&S Chemicals is the fourth small company to join the NCRC in the last year following BioArmor, Ideal Health Biotechnology and Klear Optix. The NCRC this year has also announced the addition of Standard Process Center of Excellence and the Food Processing and Innovation Center, a partnership with the NC Department of Agriculture and Consumer Services and NC State University that will help expand the food manufacturing sector in North Carolina. The ready-to-use laboratories are part of the NCRC’s mission to support startup to small biotechnology companies focused on research and development that impacts human health. As well as space, the NCRC offers business mentorship and connections to statewide entrepreneurial resources. The ready-to-use laboratories were first built in 2013 and later expanded in 2015. There are now only four out of 12 laboratory and office spaces available. Companies that choose to locate in a ready-to-use laboratory benefit from a high-speed, fiber network, secure facilities and free parking. Companies can also take advantage of the analytical laboratory services of the David H. Murdock Research Institute (DHMRI) and UNC Charlotte’s Bioinformatics Services Division as well as opportunities to collaborate with academic and corporate research programs at the NCRC. The North Carolina Research Campus, located in Kannapolis, NC, near Charlotte, has the mission of improving human health through nutrition. The scientific community of eight universities, the David H. Murdock Research Institute, global companies and entrepreneurs focus research and development on safer, more nutritious crops, healthier foods and precision nutrition. Learn more at www.ncresearchcampus.net.